CEO Gref is turning the savings giant into a universal bank with European ambitions. Shareholders would like to curb his appetite. Herman Gref was in an expansive mood. It was June 2012, and the chairman and CEO of Sberbank had just completed the biggest acquisition in the Russian banking behemoths 170-year history, shelling out $3.6 billion for Turkish lender DenizBank. To celebrate, Gref hosted a lunch for his management team at Istanbuls posh Sunset Grill, overlooking the Bosporus. Standing to face the straits deep-blue waters, Gref raised his arms in triumph. At a nearby table several Sberbank minority shareholders watched the spectacle with something less than admiration. These investors prefer that Gref focus on cranking up profits in Russia, where the bank enjoys overwhelming dominance, instead of venturing into foreign markets. I remember thinking to myself, Thats the gesture of a politician, not a banker, one of those investors said later. Gref is well aware of this kind of grumbling by the banks private sector investors. They ask us why we are going abroad, where we have no competitive advantages, and tell us we wont be able to earn as much money as we do here in Russia, the CEO tells Institutional Investor in a recent interview at the banks Moscow headquarters. They tell us if they want to buy Russia, they buy Sberbank, and if they want to buy Turkey, they buy Garanti Bank  a reference to one of the most profitable Turkish lenders. The CEO wont listen to the naysayers, though. International expansion may not move the needle much at Sberbank today, but it is vital to ensuring the groups future prosperity, he insists. The bank dominates every financial market in Russia, from savings and deposits to loans and credit cards. For the sake of Sberbanks long-term growth and stability, we have no choice but to go abroad, says Gref, who is a youthful-­looking 49. Building up an international network is just one way that Gref, a former Russian Economic Development and Trade minister, is shaking up giant Sberbank. Since taking over as chief six years ago, Gref has given the bank a much-needed overhaul, taking a branch network designed in the Communist era  with customer service to match  and bringing it into the 21st century. He has expanded into new areas like credit cards, making Sberbank a market leader almost overnight. And he has transformed the onetime Soviet savings institution into a full-fledged universal bank by building up an investment banking capability and acquiring Troika Dialog last year. We realized our clients were becoming increasingly international and if we didnt meet their banking needs abroad, we would greatly limit the scope of our business, says Alexander Bazarov, co-head of Sberbanks corporate and investment banking unit. Grefs moves have changed Sberbanks profile dramatically. The banks revenue has risen 168 percent since 2007, hitting 899 billion rubles ($28.3 billion) in 2012, while net income has more than tripled over that period, to R348 billion. But the CEO and his management team face growing headwinds on the domestic front. Russias economy, which expanded at an average annual rate of more than 5 percent for a decade, slowed to a 3.4 percent rate in 2012 and is expected to hit just 1.5 percent this year, according to the latest International Monetary Fund forecast. Investors blame President Vladimir Putin for failing to tackle corruption, improve corporate governance and strengthen legal protections for investors  factors that lead most Russian stocks to trade at a significant discount to their international peers. The slowing economy prompted Sberbank to set aside a hefty R62.7 billion in provisions for bad loans in the first half of 2013. As a result, the banks net profit was flat in the period, at R174.5 billion. That represents a sharp slowdown from 2012, when profits grew by 10 percent. Sberbank generated a return on equity last year of 24.2 percent, far above the midteen levels that most Western banks aspire to these days. Sberbank cant avoid the domestic pressures. Not only does it get the bulk of its business at home, but its stock is a bellwether of the Russian market, accounting for roughly 40 percent of the trading volume of the Moscow Exchange, the Russian stock market. Sberbank is a proxy for the Russian market, says Bob Kommers, Moscow-based analyst for Deutsche Bank. If any further evidence were needed, Gref could point to the banks first investor day in New York, back in April. When Gref asked how many of the 43 participants already owned his banks shares, all but one raised their hands. Foreign investors hold 44 percent of the banks stock. The companys share price has risen 5.7 percent this year, to R104.05; over the past five years, the share price has increased by only 26 percent. The stock is trading at just 6.4 times expected 2013 earnings, well behind the earnings multiples of Western European banks such as Barclays (10.5), BNP Paribas (11.6) and Deutsche Bank (10.15). The Russia factor is weighing on the stock, says Cristina Marzea, a London-based analyst for Barclays Capital. Sberbank should be trading at a premium, she says, citing the banks profitability and much-improved corporate governance. Gref appears frustrated by investors perceptions of Sberbank, but he is determined to maintain the groups strategy. I believe in the fundamental value of our company, he says. WITH A TRACK RECORD as an economic reformer and close ties to the Kremlin, Gref was well qualified to lead a modernization of Sberbank when he took the helm in November 2007. A descendant of German settlers in czarist Russia, Gref was born in Kazakhstan when it was still a Soviet republic. He earned a law degree from Omsk State University in southwestern Siberia, then received a postgraduate legal degree from Leningrad State University. His move to Leningrad  which regained its prerevolution name, St. Petersburg, after the Soviet collapse in 1991  proved fateful. The city was a hotbed of liberal reform thought in the post-Communist years of the early 1990s. At university there Gref met Dmitry Medvedev, future prime minister and president, and followed him into a succession of posts at the St. Petersburg mayors office. Through Medvedev he developed strong ties with Putin. From 2000 to 2007, Gref served as minister of Economic Development and Trade, gaining a reputation as a reformer by pushing for market-friendly policies and a stronger private sector. 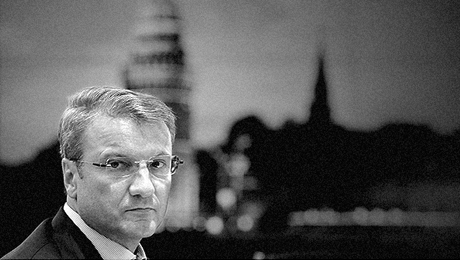 Gref has burnished that reputation since becoming head of Sberbank. His predecessor, Andrei Kazmin, ran the bank along with his mistress and first deputy chairman, Alla Aleshkina, for a dozen years. Though often denounced for their autocratic management style and lack of transparency, the couple took the first tentative steps in transforming Sberbank from a fully state-owned savings institution to a universal bank with minority private sector shareholders. Under Gref minority shareholders have increased their stakes to 50 percent minus one share. That leaves majority control with the Central Bank of Russia. Although the Finance Ministry has given no indication that it will sell off some of its remaining stake any time soon, Gref insists he will push for an even greater role for private investors. Since arriving here my goal has been to build a 100 percent market- and client-oriented bank, he says. As an outspoken liberal, Gref has demonstrated courage  most recently, by offering vocal support for his friend Sergei Guriev, a prominent member of Sberbanks board of directors. Guriev is a former rector of the prestigious New Economic School, a Moscow institution that advocates free-market policies and stronger corporate governance. In May he fled Russia for France, fearing he would be arrested because he had called for the release of Mikhail Khodorkovsky, the former Yukos Oil Co. oligarch who has been imprisoned in Siberia for a decade since running afoul of Putin and being convicted of tax fraud and other charges. Notwithstanding his emigration to Paris, Guriev was resoundingly reelected to Sberbanks board in late May. (The Central Bank of Russia did not vote for him, but board members do not require majority support.) Gref continues to laud Guriev as an independent director and insists he can participate in future board meetings by teleconference. At Sberbank, Gref has assembled a management team with private sector experience both in Russia and abroad. Some of the key members include Sergei Gorkov, who was an executive at Yukos Oil from 1997 to 2005, a period that included Khodokovskys arrest, and now runs Sberbanks international business operations; Alexander Bazarov, a former Credit Suisse and Deutsche Bank investment banker who is co-head of Sberbanks corporate and investment banking; CFO Alexander Morozov, a former chief financial officer at Renaissance Capital Bank, which dominated Russian investment banking for much of the post-Communist period; and Denis Bugrov, a onetime McKinsey & Co. partner who is Sberbanks head of strategy. Five years ago Gref and his team unveiled an ambitious plan aimed at making Sberbank more modern and efficient at home while launching operations abroad. We made a conscious choice not to focus on any one area but to try doing everything at the same time, says Bugrov. He estimates that Sberbank was a quarter century behind leading Western banks when the overhaul began. And we think that in terms of good business practices, we are now somewhere near where the big Western European banks were in 2005, Bugrov says. Sberbank dominates its domestic market like no other bank in any major country. Its 2012 net income was almost four times the R90 billion profit posted by Russias No. 2 bank, VTB. Sberbanks return on equity last year was almost twice VTBs 13.7 percent. With 18,595 branches blanketing the country over nine time zones, Sberbank dwarfs its nearest rivals: Russian Agricultural Bank has 1,583 branches, and VTB has 1,257. That explains how it has amassed 46 percent of the countrys retail deposits, about five times more than any other institution. Thanks to this ocean of cheap funding, Sberbank earns net interest margins of 6 percentage points year after year from its one-third share of the domestic corporate and retail loan market. No surprise then that Sberbank has the highest return on average assets among banks in the so-called BRIC countries: Brazil, Russia, India and China. The Russian banks 2.7 percent ROAA last year was almost twice that of Industrial and Commercial Bank of China and Brazils Itaú Unibanco (both at 1.4 percent). Sberbank has leveraged its advantages to generate strong performances in retail credit, small-business lending and fee income. More and more they are getting into market niches that were traditionally occupied by commercial private sector banks, says George Orlov, Moscow-based director of Russian financial institutions for the European Bank for Reconstruction and Development. A decade ago the government announced plans to consolidate Russias 1,100 banks and create real rivals to Sberbank. But this reform movement stagnated, leaving about 900 banks  many of them operating as private treasuries for holding companies  to survive in Sberbanks shadow. There is still space for private sector banks to grow, insists Orlov. Thats largely because banking penetration remains low in Russia. Domestic loans to the private sector were equivalent to 48 percent of GDP last year, according to World Bank figures, compared with 54 percent in Poland, 57 percent in China, 68 percent in Brazil and 194 percent in the U.S. This combination of market dominance and potential for much more growth at home leaves investors and analysts unenthusiastic about Sberbanks ambitions abroad. Many countries where Sberbank would like to grow are in a more advanced stage of market development than Russia, says Alex Kantarovich, a Moscow-based analyst at J.P. Morgan. Sberbank maintains more than a few vestiges of its history as a Communist-­era giant. The banks massive headquarters compound, topped by a 25-story glass tower, sprawls over several square blocks in a southern Moscow neighborhood. Its bloated payroll is close to the 254,000 on staff at JPMorgan Chase & Co., which last year had 3.5 times the revenue and twice the net income of Sberbank. Yet Gref has made strides in transforming the bank into a more modern and nimble institution, especially at the branch level. Just five years ago the Sberbank branch on Tverskaya Boulevard, a few blocks northwest of the Kremlin, was a throwback to the Soviet era. Long lines of customers stretched out to the sidewalk, waiting patiently to meet with tellers barricaded behind metal grilles. Affluent consumers in St. Petersburg and Moscow were shunning Sberbank in favor of the more welcoming, contemporary ambience of private sector banks. Today, however, the Tverskaya branch could pass for a banking outlet in Zurich or Berlin. A phalanx of ATMs at the entrance reduces the number of waiting customers to a trickle. Those who do proceed inside tap an electronic screen to choose the service they need: savings and deposits, checking, credit card, loans, foreign exchange. They take a ticket and sit in a waiting room with bird-and-plant motifs on the walls and the soft strains of a piano sonata in the air. When their number appears on an overhead panel, typically after a brief wait of a minute or two, they go to an available teller at an open counter  minus the metal grille. At a desk in the adjoining room, a credit officer discusses consumer loans and mortgages with a couple while their child traces multicolored doodles on a large electronic screen installed to amuse customers offspring. Five years ago only about 30 percent of the transactions at Sberbanks branches were automated; 70 percent went through tellers. Today tellers handle less than 25 percent of transactions. The comparable ratio for banks in the euro zone is less than 10 percent, according to the European Central Bank. Sberbank executives hope to pare that figure to 12 percent over the next five years. We think that by working on recurring activities, like people paying utility bills, we can significantly reduce the transactional role of the branches and make them more sales- and service-oriented, says Bugrov. Even more painful and costly has been Sberbanks inability to shrink its head count. When Grefs team got started in 2008, they proposed to reduce the payroll from a quarter ­million employees to 220,000 within five years. But after an initial dip to 232,000, the head count is back up to 245,000, plus 41,000 employees at foreign subsidiaries acquired over the past four years. The problem, executives say, is that Sberbanks balance sheet  which soared from R6.7 trillion in assets five years ago to R15.1 trillion in 2012  requires high staff levels until the centralized IT platform and other high-tech investments are fully operational. Moreover, Sberbank over the past three years has significantly raised salaries, which had lagged other banks. Staff costs leaped by 22 percent last year and accounted for R246 billion of the banks R451 billion in operating expenses, which themselves grew by almost a third. Little wonder that cost growth has become the biggest concern of minority shareholders. Over the past three years, costs have risen much faster than revenue because of IT investments, branch modernizations and salary increases. In 2009, Sberbanks cost-to-income ratio was 35 percent; by the end of last year, that ratio had climbed to 49 percent. By contrast, Polish national champion PKO Bank Polski had a cost-income ratio of 39.6 percent last year, while Hungarys OTP Bank was at 46.2 percent. But Gref insists that he will continue to spend more than $2 billion a year for the renovation of branches and unspecified billions more to complete the centralized IT platform. We cannot decrease the pace of our investments if we want to build a solid foundation for our future growth, he says. Sberbank has been able to demonstrate to investors that certain big-ticket products and services are well worth the money poured into them. Thats the case with credit cards. The bank got into the game late, issuing its first credit cards only four years ago. Yet today it leads the market with more than 9 million cardholders. Last year credit cards accounted for 3.5 percent of Sberbanks net income; the bank predicts that figure will mushroom to 10 percent by 2014. This is typical of a product that required large IT investments and other expenses  with great results, says Deutsche Banks Kommers. Insurance is another winning investment for Sberbank. Launched only in 2009, the insurance business last year accounted for about 5 percent of net income, or R17.4 billion, an amount larger than the combined profits of the rest of Russias insurance industry. Bugrov predicts that within five years insurance income will surge to 12 percent of total bank profits because the company will recruit new policyholders from among the 106 million Russians who hold Sberbank savings and deposit accounts. Its not about acquiring new customers, just strengthening our existing relationships, he says. Last year Sberbank CIB advised AF Telecom, an investment company owned by billionaire Alisher Usmanov, on a $6.5 billion shareholder restructuring that allowed AF Telecom to take majority control of Megafon, Russias second-largest mobile phone operator, while Swedens Telia­Sonera reduced its stake. It subsequently acted as joint global coordinator and book runner for Megafons $1.8 billion IPO on the Moscow and London stock exchanges in November 2012. Sberbank CIB generated net profits in excess of $250 million in 2012. The bank predicts it will double this mark by the end of 2013. Sberbank trails VTB Capital, the Russian leader in most investment banking league tables, but it is closing the gap. Last year VTB held the top spot in investment banking net revenue, with $96 million, according to data provider Dealogic; Sberbank was a close second with $93 million. VTB ranked first as a debt capital market book runner, with deals worth $15.6 billion; Sberbank was second with $10.7 billion. The one category in which Sberbank led VTB was equity capital markets: The bank acted as book runner on deals worth $1.6 billion, good for second place behind Credit Suisse; VTB ranked eighth, managing $366 million worth of deals. With investment banking in retreat in European financial centers, Sberbank CIB has little difficulty attracting experienced recruits, mostly Russians. Notable hires over the past two years include Sergei Chinkis, onetime global head of metals and mining at HSBC Holdings; Igor Ukrasin, Credit Suisses former head of oil and gas for Russia and the Commonwealth of Independent States; Todd Berman, who had been global co-head of media and telecommunications at Bank of America Merrill Lynch; and Maxim Kolodkin, an exGoldman Sachs Group managing director responsible for several industry sectors and M&A in Russia. Though minority shareholders applaud Sberbanks strides in credit cards, insurance and investment banking, there are other potentially lucrative businesses that some investors wish the company would resist. In April of this year, Sberbank and its wholly owned subsidiary, Sberbank Leasing, signed a deal with Boeing Co. to purchase a dozen 737-800 passenger jets worth a total of $1 billion at list price. Sberbank intends to lease the planes to one of its leading corporate clients, Transaero, a Russian charter and discount airline. The bank has long provided financial leasing to Russian airlines, but this is its first operational leasing venture. And more are ahead, according to Gref. This is a new and very interesting area for our leasing company, he says. The Russian commercial aviation market is growing 20 to 30 percent a year. Operational leasing will not be confined to aviation, he adds, citing an expansion of the banks role in the financing of freight train cars and future ventures in medical equipment and other still-unspecified businesses. But minority shareholders are loath to see Sberbank stray from banking and insurance. I think most investors believe a bank should stick to its core business, says Jacob Grapengiesser, Moscow-based partner at East Capital International, which has some $3 billion in Russian assets under management, including holdings in Sberbank. Sberbank insists that any view of its core banking business should include its operations abroad. We are no longer just a Russian institution but an international financial group, says Bugrov. The bank began its outward thrust in the former Soviet republics of Belarus, Ukraine and Kazakhstan. They have always been very close to Russia, really part of the same Russian-speaking world, says international business development chief Gorkov. Beyond cultural affinities, there is trade: Belarus and Ukraine send more than 50 percent of their exports to Russia, and Russian goods and services total more than 40 percent of Kazakhstans imports. Gorkov likens the economic ties between Russia and these countries to those between Mexico or Canada and the U.S. So its very logical that Sberbank went first to Belarus, Ukraine and Kazakhstan, he says. Sberbanks subsidiaries in those countries have performed better than local and foreign rivals. Sberbank Kazakhstan  the former Texakabank  is the earliest of these acquisitions, predating the Gref era. It ranked 15th by assets in its home market when Sberbank acquired it in 2006 for an undisclosed amount; today it is the No. 6 bank in the country. The banks assets rose by 37.4 percent last year, to R147 billion, while net income more than doubled, to R5 billion from R2.3 billion. Kazakhstans economy has been buoyant thanks to its oil and gas production. But Sberbank also has been able to show impressive gains in recession-hit Ukraine over the past year even as Germanys Commerzbank, Austrias Erste Group Bank and Swedens Swedbank have withdrawn from the country in the face of a surge in nonperforming loans. Sberbanks Ukraine arm, the former Bank NRB Ukraine, has risen to ninth place by assets, up from 36th when it was acquired at the end of 2007 for an undisclosed sum. Assets grew by 44 percent last year, to R99 billion, while net income rose 23 percent, to R1.6 billion. Over the past two years in Belarus, widespread human rights violations have helped to scare away Western lenders such as BNP Paribas, Deutsche Bank and Royal Bank of Scotland Group, which had been operating in the country for a decade or more. But Sberbank, which bought the former BPS-Bank in 2009 for $281 million, has increased its commitment, boosting its market ranking two places, to third. We didnt stop lending, and last year we earned a sizable profit, says Gorkov. The subsidiary grew its assets by 6.6 percent last year, to R113 billion, and posted net income of R800 million, compared with a R400 million loss in 2011. Encouraged by its quick success in the former Soviet republics, Sberbank has made inroads into Central Europe, albeit with disappointing results thus far. In February 2012 it spent 500 million to purchase all but the Romanian business of Austrias Volksbank International, which operates 291 branches in eight countries. It quickly discovered that the banks asset quality was even worse than it first appeared, a fact that has led some foreign shareholders in Sberbank to question the banks due diligence procedures. The unit racked up losses of R8 billion in 2012. In the meantime, Sberbank has replaced the banks management, cleaned up its troubled loan portfolio and invested in a new IT platform. Gref and his team plan to transform Volksbank International from a lender focused heavily on real estate development into a more diversified bank with a better balance among retail, small- and medium-size business banking and corporate lending. Volksbank International is perhaps the most challenging segment of Sberbanks foreign portfolio, says J.P.Morgans Kantarovich. The banks operations are spread thinly across the Czech Republic, Slovakia, Hungary, Bosnia and Herzegovina, Croatia, Serbia, Slovenia and Ukraine, with weak franchises in each country and a variety of IT platforms that makes economies of scale difficult. Moreover, the faltering euro zone economy casts a shadow over these markets. This year our task is to minimize our losses, and next year we hope to start making profits, Gref says of Volksbank. But investors say such efforts might be better spent elsewhere. Turkey is the one foreign market that investors acknowledge has the potential to generate reasonable profits for Sberbank. With the acquisition of DenizBank last year, Sberbank claimed Turkeys eighth-largest bank, with 47.6 billion Turkish lire ($24.2 billion) in assets and 600 branches. In April of this year, Sberbank bulked up its presence by purchasing Citigroups Turkish consumer business  with 600,000 customers, TL1.2 billion in assets and TL1.5 billion in deposits  for an undisclosed price. DenizBank was clearly a much better acquisition than Volksbank International, says Deutsche Banks Kommers. It has a track record of good growth and profitability. Turkey is also a far more attractive market than the Central and Eastern European countries where Sberbank operates. The countrys economy has expanded at an annual rate of more than 6 percent over the past decade, and the banking sector appears to have plenty of room for growth. The loan-to-GDP ratio is a modest 69 percent, compared with more than 75 percent in the Czech Republic and Hungary, both of which have recently fallen into recession. But the move is not without risks. Turkey has suffered more than most emerging-markets economies from the tightening of global liquidity triggered by the Federal Reserve earlier this year. The Turkish lira has fallen nearly 10 percent against the dollar since May, prompting the central bank to hike its key short-term lending rate by 1.25 percentage points, to 7.75 percent. In terms of assets and funding mix, Deniz­Bank is a good fit for Sberbank. About 25 percent of the Turkish subsidiarys assets are retail and 75 percent corporate  roughly the same breakdown as at Sberbank. Both banks are focused on increasing their shares of the SME market. And just as at Sberbank, retail deposits are the most important source of funding at DenizBank. Sberbank executives wax enthusiastic about potential synergies between the two markets. There are some 1,500 Russian companies operating in Turkey and about 5,000 Turkish companies in Russia. 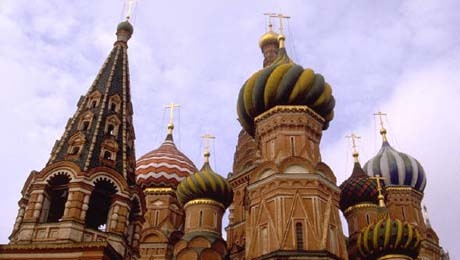 Turkey has become the biggest tourism destination for Russians, with 3.5 million traveling there in the summer of 2012. We are building up financial services for them and their travel agencies, says international business chief Gorkov. Will these strides abroad change the views of minority shareholders who want Sberbank to stay home? Gref concedes that expansion abroad has brought nothing but headaches and harsh criticism from investors thus far. At recent investor-day presentations in London and New York, he promised a two- to three-year pause in further acquisitions. Read more about banking and corporations.